If you sell books on Amazon you may find the "Overstock Wizard" useful. It uses two Amazon API's (Application Programming Interface). Namely the "Amazon Marketplace Webservice API" and the "Product Advertizing API". 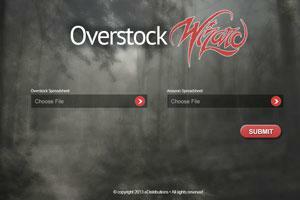 The "Overstock Wizard" allows you to submit a list of product-ids, query the items in your overstock, and generate a customized report. Many of the steps in the process of generating the report have been streamlined with the Amazon APIs. Before the process was streamlined you were required to log in to Amazon, go to your inventory reports, request the "Active Listings Report", wait 45 minutes, download it, convert it to a .csv file, upload it, and run it against your list of Product-Ids. The "Request" button automates all these steps! Also your list of Product-Ids can consist of of ASINs (Amazon Standard Identification Number), ISBN10s, or ISBN13s (International Standard Book Number). You will notice two fields labeled "Overstock Spreadsheet" and "Active Listing Report" and three buttons labeled "Submit", "Request", and "Check". First create an "Overstock Spreadsheet". The spreadsheet consists of a list of Product-Ids (ASINs, ISBN10s, and ISBN13s). Save the file as a .csv (Comma Seperated Value). This can be accomplished by copying and pasting from a spreadsheet a single column of Product-Ids into a text editor and saving the file with a .csv extension. Only one column is necessary for this report with Product-Ids consisting of ASINs, ISBN10s, or ISBN13s. Once you have your "Overstock Spreadsheet" completed your would click the "Request" button. (Do not "Submit" your "Overstock Spreadsheet" until your request is processed! It takes Amazon 45 minutes, give or take, to generate your "Active Listings Report". While you are waiting you can check the status of your request by clicking the "Check" button. Checking the status of your report returns two messages. When your request is "Processed!!!" you are now ready to "Submit" your .csv file. (Your list of Product-Ids.) Which will generate a "report.xls" file. You should get a popup asking you if you want to save or open the file. When you open the report in Excel it should ask you how you want to delimit the report. You would want to select the tab delimited option.